I’m on an Indian food kick so I have been using a lot of curry powder for cooking. Curry powder is readily available in most supermarkets, but, wow! Is it ever expensive! A small 2 oz. bottle of curry powder (Spice Islands brand) costs a whopping $7.50 at Gelson’s here in Southern California! Whole Foods Market actually had a better deal for about $5.50 (Spicely brand), but it is not always in stock. I thought maybe I could find a better deal online. My wife found the best deal. 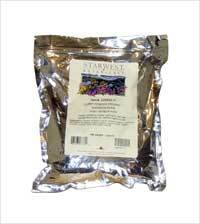 Starwest Botanicals has organic curry powder in a 1 lb. resealable bag which we were able to get from Vitacost.com for about 9 bucks! We buy a lot of vitamins and other botanicals from Vitacost.com so it was a no-brainer. It tastes good in the dishes we prepare, so we are very happy with it.